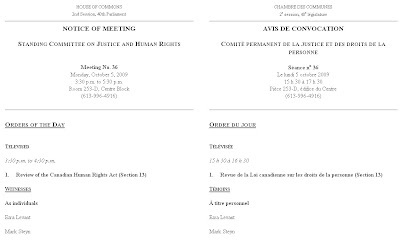 On Monday, October 5, 2009, from 3:30 p.m. to 4:30 p.m, journalist Mark Steyn and Blogger Ezra Levant are going to testify before the Standing Committee on Justice and Human Rights (JUST). Their testimony is about Section 13 – Canada’s internet censorship legislation. The testimony is going to be televised on ParlVU, and perhaps at a later time on CPAC.